Description: Formerly known as The Terminal Building and then the River Walk Corporate Centre, this 868,000 square foot 6-story brick property was purchased in 2016 for future reuse. Designed in 1898 and completed in 1906, it was once considered the largest, most efficient cargo warehouse between New York City and Chicago. 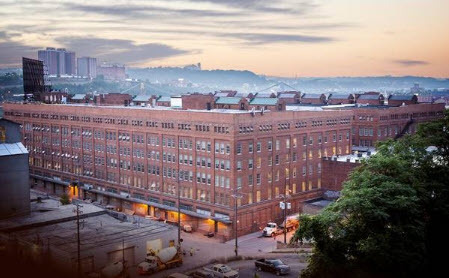 Allegheny Construction Group was hired by McKnight Realty Partners as the Construction Manager to convert this massive historic terminal, into a creative and chic office/retail complex. The Highline will feature a 500-foot-long elevated green park-like space, complete with lighting and seating, that will extend to an overhang with views of the Monongahela River and City of Pittsburgh. The complex will be convert interior parking for 521 vehicles, bike storage, a public fitness center, and over an acre of green public space along the Three Rivers Heritage Trail to be used for events such as concerts and farmer’s markets. The cost of The Highline project, once complete, is estimated at $100+million.